US, 2011, 86 minutes, Colour. Warren Christie, Ryan Robbins, Lloyd Owen. Directed by Gonzalo Lopez- Gallego. 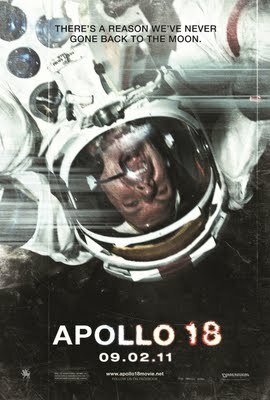 Moon expeditions have made for some excellent films, especially Ron Howard’s Apollo 13. This brief film is not in the same league. It is a modest (though a very long final credits indicates that a great number of people worked on it, especially for the effects). But, the original moon landing and other space journeys have been fodder for conspiracy theorists. Even back in the 1970s, writers concocted the entertaining Capricorn One where it claimed that the whole thing was faked and filmed on a set. Recently, Duncan Jones’ Moon made audiences wondering what was going on up there. This time, we are in Blair Witch film-making territory, that genre where fiction is disguised as fact. This is a kind of Lunar Paranormal Activity. We are told that there was a secret moon voyage after the US terminated the Apollo series with Apollo 17 in the early 1970s. Then it is claimed that a lot of footage from that time has turned up and this film has been edited from it. It seems there is no limit to the variations on this alleged cinema verite. So, we are introduced to three genial astronauts, their training and mission. Most of the footage is of them in the shuttle, exploring the moon, making strange discoveries there of wrecked vehicles – and they wonder whether the Russians didn’t secretly arrive on the moon. But, there is a dose of Alien and infection, so we now know what really happened - and the secrets of the American government to preserve secrecy and the cover story of the disappearance of the astronauts. If you like this kind of thing, here it is. If not, it will be a little tedious and repetitious, and making a lot of challenges to the imagination. The special effects artists have spent a lot of time making the footage look as if it is real rather than computer-generated, which means that they are avoiding spectacle and aiming for visual ordinariness. Which may please the science and technology buffs but makes the rest of us look forward to the next high-powered, high budget thriller! 1. Audience interest in moon exploration, landings? The American history? Conspiracy theories? 2. The plausibility of this plot – or implausibility? 3. The film presenting fiction as fact? The look of the footage, its credibility, the style of photography, the information, dates and places? Issues of secrecy and cover-ups? The role of the government? 4. The visuals, beginning with the ordinary American family, barbeque? Training? The transition to the voyage, the spacecraft? The moon, the surface of the moon? Space? The visual effects for the intrusion of the alien? 5. The introduction, the information about moon landings, the Apollo voyages? Finishing with Apollo 17? 6. The astronauts, their characters, American style, family, the request for them to go to the moon, the secrecy? 7. The picture of the flight, the characters of the astronauts, their interactions, contact with the US? 8. The moon, the surface, audiences familiar with the moon’s surface from documentaries? The walk, finding the prints, the abandoned craft, wariness? The theory that the Russians had reached the moon? Speculations with headquarters in the US? 9. The aliens theory, the effect, stranded, the infiltration into the bodies of the astronauts, the speculations, communication with headquarters? 10. The decision to go home, jubilation, rescuing the stranded astronaut, the discussions with headquarters, the medical situation, the men talking amongst themselves, the authorities and the lies? 11. The attempt for rescue, the warnings from headquarters, the destruction of the spacecraft and the men? 12. The nature of the cover-up, the information given about what is said to have happened to the astronauts? 13. Audiences believing this kind of story, information, speculation? The genre and its style?